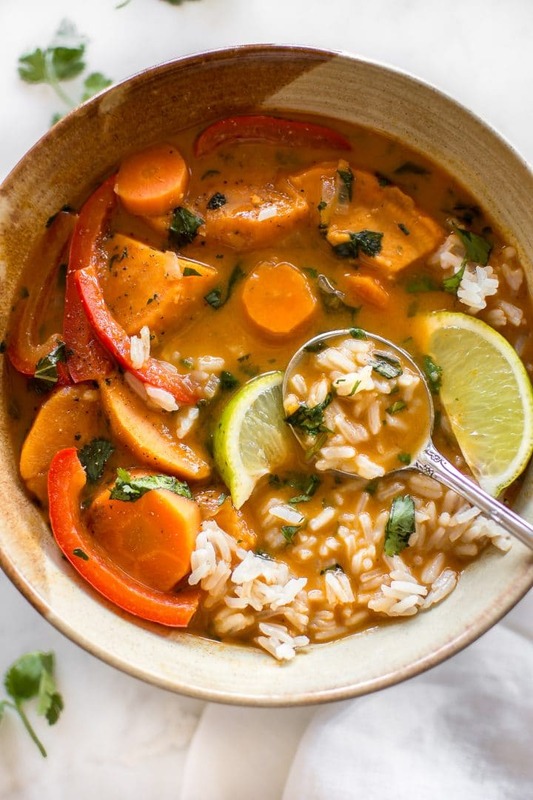 This vegan Thai sweet potato curry is a hearty plant-based meal that’s healthy, flavorful, comforting, and filling. Easy to cook & it makes great leftovers! Where has this Thai vegetable curry been all my life?! I’ve made it for work lunches three times already. It’s really easy to make, and a pot of it is easily 5-6 meals for me. It nukes like a dream, I get some veggies, and the coconut milk makes it luxuriously creamy. This is definitely one of the best vegan recipes I’ve ever made. 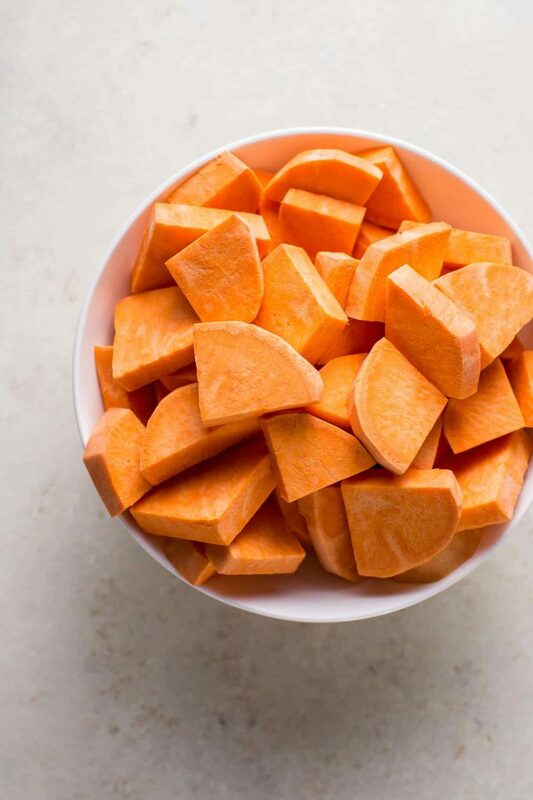 The sweet potatoes just melt in your mouth… and they release starch to make the creamy coconut sauce extra delicious. 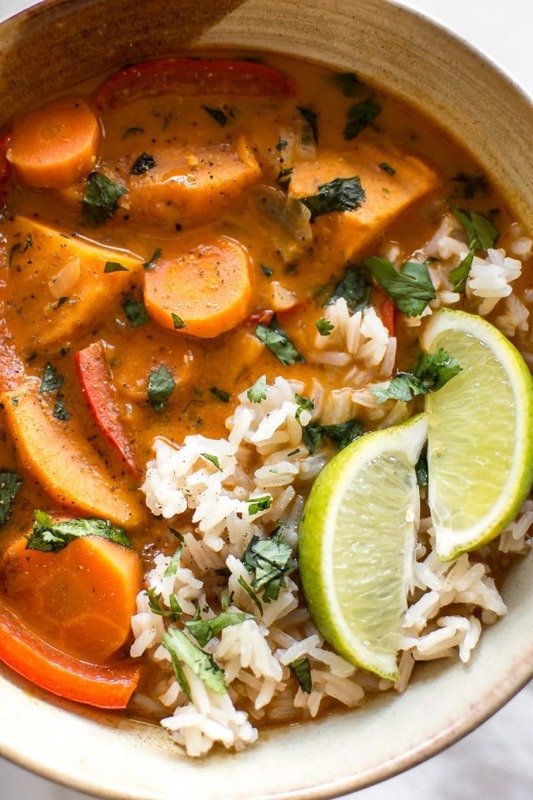 This vegan coconut curry is easy to make. You just chop things as you go along and add them to the pot. It doesn’t take much effort, any particularly fancy ingredients, or too much time. I’m really liking sweet potatoes lately! Not long ago I posted these sweet potato pitas with arugula and garlic dressing, and I made them on the same day as I first made this curry. I was actually going to use chicken in this recipe, but I decided not to at the last minute. I had sweet potatoes on the brain since I had already decided to make the other recipe, so that’s how this Thai sweet potato curry recipe happened! The juice from half a lime goes into the pot while cooking this meal, but I suggest serving it with extra lime on the side so everyone can adjust this recipe to their individual taste preferences. It’s a little sweet and a little sour and a whole lot of delicious. You can also adjust the amount of curry paste to suit your preferences. I kept it at a heaping tablespoon. The finished result offers plenty of flavor and a little heat, but not more than I, the spice wuss, can handle. The fresh ginger also adds a bit of heat and zing, so keep that in mind. You’ll notice that I served this with rice. That’s optional. I typically measure out 1/4 cup uncooked jasmine rice, cook it, and add it to the pot when everything else is done. In the recipe I recommend adding fresh basil and cilantro in at the end. If you’re tempted to skip that step, I do suggest using at least one of the two herbs – it really does add another dimension of flavor and freshness to this bowl of comfort. I’ve made this easy coconut curry with more veggies than indicated (e.g. a large sweet potato and more than one large carrot), so I simply add more vegetable broth to the pot so the veggies are covered when you’re simmering them. I recommend using full fat coconut milk as suggested for this sweet potato curry recipe. Yes, the calorie count is scary when you’re staring at the can attempting to do the math, but if you think about it, the rest of the recipe is veggies, and this recipes makes at least 4 generous servings. I really hope you enjoy this vegan Thai coconut curry recipe! Let me know in the comments below if you’ve made it or if you have any questions. 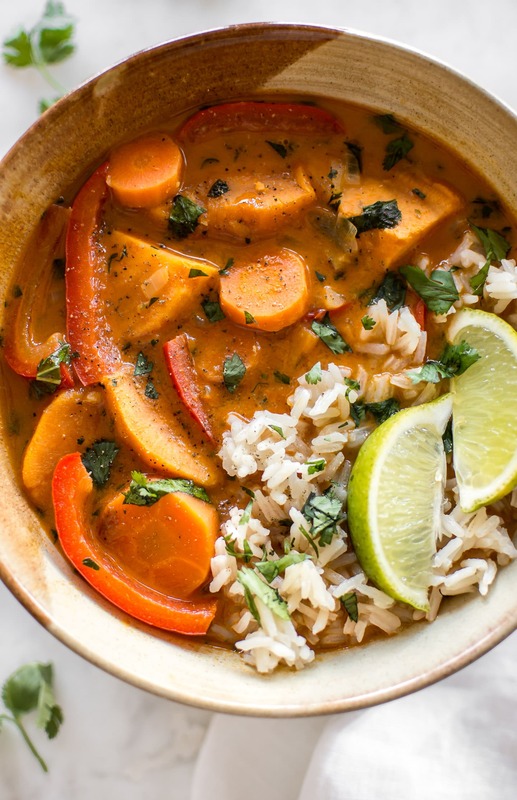 This vegan sweet potato curry is a hearty plant-based meal that's healthy, flavorful, comforting, and filling. It makes great leftovers! Heat olive oil on medium high heat in a fairly large soup pot. Add the onion and sauté for 5-7 minutes, stirring occasionally. It's ok if it goes a little brown - that adds more flavor. Add the garlic and ginger to the pan and cook for about a minute, stirring, until fragrant. Add the veg broth, curry paste, sweet potato, and carrot. Stir. Increase heat so it comes to a boil, then reduce to medium-low heat and simmer for 10 minutes. Add the coconut milk, soy sauce, red pepper, lime juice, and sugar. Increase heat to medium-high and let it simmer for another 10-15 minutes (if it's bubbling furiously, reduce the heat). The sauce will thicken up a bit and the veggies will fully soften. Before serving, add the chopped herbs and cooked rice to the pot or to each bowl depending on how you want to serve it. Serve with extra lime wedges on the side. I recommend playing with the curry paste, lime, and soy sauce quantities to suit your individual tastes. I'd stick to one tablespoon of curry paste if you're not a big spice fan. The ginger also adds a bit of heat, so keep that in mind. I sometimes add a bit of extra soy sauce (I like it salty) and some extra lime to my bowl. I measure 1/4 cup uncooked rice, cook it, and then add it to the pot at the end. This isn't a lot of rice for such a large quantity of curry, so keep that in mind if you want a full serving of rice for each person. I think this curry is hearty enough without a lot of rice, so that's why I don't add much. I use Thai Kitchen red curry paste in this recipe. It's vegan. Some others contain fish ingredients so just make sure to read the label if that's an issue. You may also like my Thai quinoa salad or my 15 minute Thai green curry soup. You’ve made this three times for yourself and zero times for me? Seriously? Since my daughter moved back we’ve been enjoying more Thai inspired recipes, together. We will love this! I can’t wait to make it for her! I absolutely love any, and everything, curry so this dish is definitely screaming my name! Plus I’m rather obsessed with sweet potatoes as well, so I love they they are the star of this dish! I can totally see why you have been eating this on repeat – it looks FABULOUS! Cheers, girlfriend! Thanks dear! ???? Sweet potatoes are the best really. Your ingredients list says tsps of curry paste, but your notes refer to tbsps of curry paste. I assume you mean tbsps, but not everyone reads the note. Sounds good–I’m trying to cut back on meat and I love Thai. Oh geez, sorry, yes, it should be 1-2 tablespoons of curry paste. I proofread that recipe like 5x and still missed it. 🙁 Good catch! Hope you enjoy the recipe! A hearty and mouthwatering vegetarian stew to feast the eyes and palate. 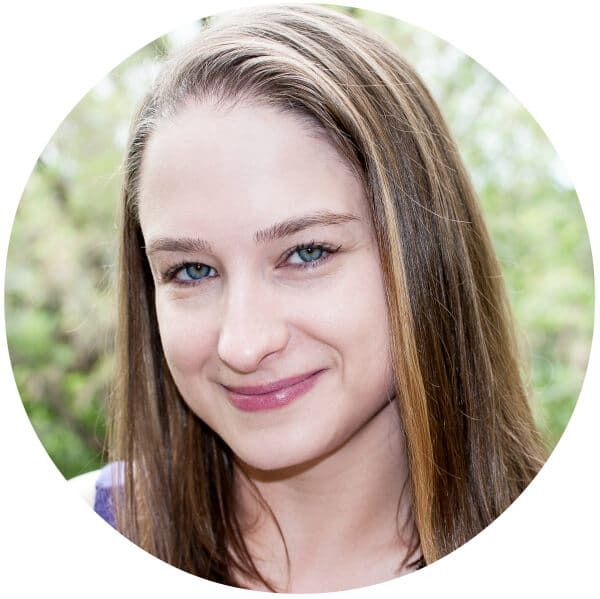 Love your creations, Natasha!!! This looks very tasty. I will have to try soon. My favorite Thai places is miles and miles away. This will ease the pain. Hope you love it, Mimi! ???? Kicked mine up a heat level by adding a halved serrano in with the carrots and potatoes, then added a little more meatiness to it with sliced mushrooms with the red bell peppers, great recipe and fun to customize! Thanks!